SINCE my last diary the season kicked off properly meaning plenty of racing, travelling and training. As season starts go it’s been a mixed bag with some highs and lows, but that’s bike racing and to be expected. I have won two UCI C2-ranked races and a National A event in Great Britain accumulating those all important UCI points that help with gridding at the bigger races in Belgium and on the World Cup circuit (gridded on the second row recently - Ed). Winning bike races doesn’t happen all that often for me so I always really enjoy doing so. At Southampton (C2-ranked UK National Trophy) I had extra tough competition from some Belgian visitors in the form of the Telenet-Fidea under-23 duo of Quinten Hermans and Jens Vanderkinderen. 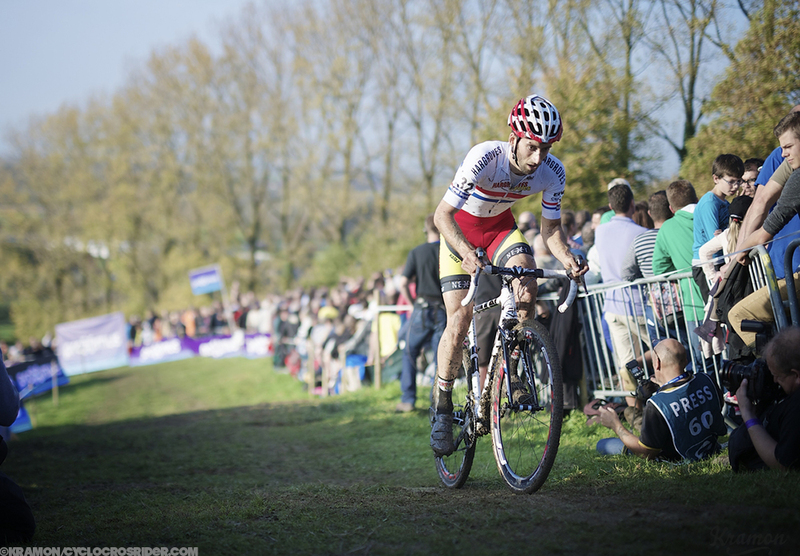 Both are good prospects for the future and at the fore of the under-23 races in Belgium. I knew it would be a hard, but good battle for the win and it was great to secure first place in front of a ‘home’ crowd. This was a week after the opening round of the UCI World Cup in Valkenburg that had been very close to a disaster. The night before the opening World Cup is not the night you want to be throwing your guts up, but that’s unfortunately how I spent the Saturday evening before Valkenburg, I had picked up a stomach bug from somewhere and couldn’t do much about it at that stage. I put on a brave face (main photo) and tried to get on with the race but even the conditions were against me. Dehydrated from the night before and with temperatures up around 24 degrees, I was more or less on my knees after 20 minutes and desperately trying to hang on to a top 30 position to rescue some overall World Cup points. I managed to finish 30th, totally empty. It took me a good few days before I felt 100% again but I looked after myself and it is well and truly behind me now. I can count myself lucky that I manage to finish at all. My favourite weekend of the season soon followed at the Koppenbergcross - Zonhoven double-header. Normally we get at least one day between them, but no, not this year – they were back-to-back brutal races. I was racing in 11th place at the Koppenberg (above) when I dropped chain and further problems led to a run to the pits. Dropped back down to 20th, I fought hard to get back to 15th, but annoyed at what might have been considering how I felt and was riding. So it was on to the next day – the Superprestige in Zonhoven - where again I rode really well battling for a top 12 for the whole race until it really mattered and my legs started to wobble. I ended up 17th, 20 seconds off 12th place, small margins in time, but that all-important top 15 just out of reach. The recent races have seen me use almost the full Challenge tread range from the Grifo XS at Zonhoven to Grifo’s at Southampton as well the new Baby Limus at the Shrewsbury National Trophy round in the UK. I’ve found a nice set-up of Grifo rear and Baby Limus front for when things are slippy in the corners but fundamentally a fast day like this year’s conditions at the Koppenberg. The only tread left now still in wheel bags is the full Limus which could well get their first outing this coming Sunday (November 16th) at the legendarily severe Asper-Gavere Superprestige. After six weeks of consecutive racing, I opted to miss Ruddervoorde, and the smaller races that littered Europe last weekend, to instead get a ten-day block of training in. With so much racing on (in the season) it is difficult to really build form, it’s more just fine tuning and maintaining, so it has been nice to really overload the body again and hopefully having something more in the tank for the coming races. There are three big weekends of racing coming up now with, as I mentioned, Asper-Gavere, then the second and third rounds of the World Cup quickly follow in Koksijde and Milton Keynes!!!! I am getting excited, and nervous, now for the first ever UK World Cup. It will be a great opportunity and it was the main reason I forced myself out riding in the rain this morning with tired legs. Hopefully all the bad luck is out of the way now and I can get on with bringing home those bigger results in the coming weeks. Here is your opportunity to quiz three-time British champion Ian Field about cyclocross… Ian is happy to answer any questions that Cyclocrossrider readers may have about the recent racing. If you have a question(s) about a specific race or things that happened in races involving Ian or not then please email them to events@cyclocrossrider.com (before December 1st) and Ian will do his best to give you an ‘insider's view’ of a particular race or incident in a forthcoming Diary.